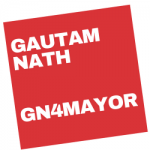 I am not a politician, I am not a bureaucrat, I am not a businessman, I am Gautam Nath. 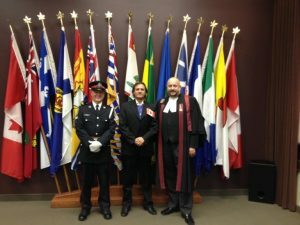 An MBA, with over 2 decades of working for global multinational corporations both internationally and in Canada, I am your colleague, or your friend, having traveled the corporate journey from internship to Board of Directors, I am the professional Canadian citizen. Toronto is my home and Toronto is where I have dedicated the last 10 years in giving back; by mentoring, by sharing knowledge and by motivating residents to build a great life for themselves and their next generation. We have to think futuristic, we have to build sustainability and we have to future-secure Toronto for the next generation. 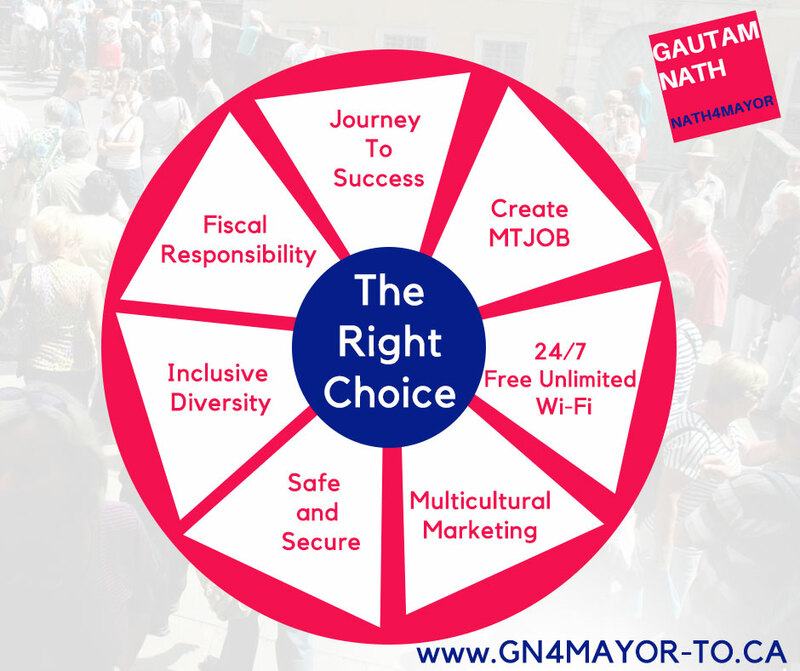 That is why I am running for mayor, no more smoke and mirrors, no more lofty campaign promises, just roll up our sleeves and do some hard work. I have been there and done that and now I bring you a choice to make the difference. Your support is critical if you want your tomorrow to be different from our yesterday. A.T. Kearney has just released its 2018 global cities report that ranks top 25 global cities in the world based on parameters like business activity, human capital, information exchange, cultural experience, and political engagement. As per the report, Toronto has moved down compared to 2017 and currently ranks #18. Another key takeaway from the report is the entry of several Chinese cities in the Top 25 ranking. The report suggests that the ability of Chinese mega-cities to attract multinational companies and a robust growth ecosystem is what is driving ranking of Chinese cities upwards. Clearly, work is cut out for the Canadian leadership. My vision as the Mayor of Toronto is to place Toronto among the top 5 global cities by 2023. Just like the Chinese cities, I believe, to achieve this vision for Toronto a growth ecosystem is vital; which comprises 3 key pillars – business, social and government. My 10 Point Action Plan has been crafted keeping in mind this ecosystem. Work with leading Tech companies to invest heavily in Smart Tech City projects to enhance technical capabilities and infrastructure for Toronto. Foster current Smart Tech city proposals from Google, Nokia , and Sidewalk without compromising on data ownership rights. Participating in Alberta Smart City alliance challenge to capitalize on an opportunity to raise 50Mn$ for Toronto municipality. Mandate companies headquartered in Toronto to invest 5% of net income on the Sustainable Development Goals (SDG), identified for Canada basis the UN guideline. An SDG Survey, conducted in 2008 highlights that corporate is currently not actively pursuing UN assigned SDGs. There is a lack of awareness of SDGs and even those corporate that are aware are focusing on goals that are not priorities for Canada. The top 3 SDG priorities for Canada are Climate Action, Sustainable cities, and communities, Responsible consumption and production. These are not even among the top 5 list of priorities for corporate. Reviving this mandate will help ensure that corporate brings focus and invest in the same driving sustainability for our city of Toronto.I believe the successful achievement of these goals will be a stepping stone in putting Toronto in the top 5 global cities by 2023. Let’s take charge of our future by voting for a leader who has been recognized as Canada’s Top 25 Immigrant, a recipient of Ontario’s highest recognition for volunteers, the June Callwood Award and in May 2018, received Canada’s highest recognition for volunteers, The Sovereign’s Medal. All symbolizing that I care, I have the passion for our people yet I bring skilled experiential knowledge that is critical in developing sustainable goals for the future.